For clients, it can be hard to see the big picture when it comes to an effective internet marketing strategy. Their initial response is similar to “I need to get traffic to my site immediately. How can I get results today?”. The mentality is always now, now, now! Before you can even respond to that question, you need to take a step back. I think a key conversation that is often overlooked, is identifying your clients primary objectives and goals. Without properly identifying what you want to accomplish, your goals will rarely be fulfilled. As an Internet Marketer, it is our job to educate the client on the different ways to gain exposure on the web and help drive relevant traffic to your site. I wanted to discuss the difference between search engine marketing and search engine optimization and how they can bring short-term and long-term results. PPC (pay-per-click) is an advertising model used by search engines, advertising networks, and content web sites, where advertisers only pay when a user actually clicks on an ad to visit the advertisers website. If you are looking for a short-term approach, Pay-Per-Click advertising is great for getting immediate traffic to your site. You can have a PPC campaign up and running in less than 15 minutes. Unlike traditional advertising like TV, radio, and print, PPC advertising drives only relevant traffic to your site. You control which keywords/phrases you want your ad to show up for. You also can track all of your campaigns with web analytics software, like Google Analytics. Clicks can cost anywhere from $.05 to upwards of $45.00. The cost per click vary depending on what your Ad Quality Score is. Keyword relevance, quality of your destination landing page, bid price, and Click-Through-Rate (CTR) all play a part in how your ad quality score is calculated. Another factor to consider is how much PPC competition is there and what are your competitors willing to pay per click? Branding: Even if the user doesn’t click your ad, you are still building your brand awareness. Budget: Have total control over your daily ad budget. Spend as much or as little as you would like. Geo-Target: Have the ability to control where your ads are shown. Target specific countries, states, cities, or a specific radius. Keywords/Phrases: Bid on relevant keywords/phrases that your potential customers are searching to find you. You may also add negative keywords, which are keywords that will trigger your ads to not be shown. Ad Copy: Pre-qualify your potential customers in your ad message. Create A/B testing sceneries to see which ad copy generates better click through rates. 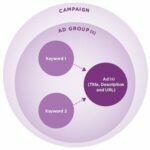 Campaigns: Create small, targeted, themed ad campaigns for very effective use of your ad spend. Landing Page: Control where you land the searcher on your website. If someone was searching for green widgets, you can land them on an interior page on your website that talks about green widgets, rather then just sending them to your homepage. Special Offers/Promotions: Create time-sensitive campaigns for special offers and promotional products. Web Analytics: Track all of your campaigns and web traffic to see which keywords are performing better. ROI: See your return on investment by tracking Goals. Goals can be a sign-up form, a sale, a download …anything you want to track. Lower CTR: Generally PPC advertising brings lower click through rates. Pay-per-click ads are typically trusted less than organic search results because searchers know that anyone can pay for a sponsored ad. PPC: You are paying for traffic to your site. Search Engine Optimization (SEO) is the process of improving the volume and quality of traffic to a website from a search engine via “natural” search results for targeted keywords. If you are serious about having a major presence online, you cannot ignore optimizing for search engines. You can have the nicest looking site out there, but if it is not properly optimized, nobody will find you site and you will miss out on tons of traffic. Remember, the key to search engine optimization is patiences! Do not expect to be ranked #1 for competitive keywords in the first week, first month or even first year. It really all depends on how committed you are to improving your web rankings. Unlike Search Engine Marketing, SEO requires a lot more time and effort. The major search engines like Google, Yahoo, and MSN all have complex algorithms that make up which websites are shown for specific keywords and phrases. Google’s algorithm is made up of over 100 factors. To properly optimize your website to get on the first page of Google, depends on those factors. Competition: How optimized are your competitors? This will give you a rough idea as to how hard it will be to rank above them for your niche keywords. Keywords/Phrases: What keywords do you want to rank for? The broader the keyword, the harder it will be to rank organically. Content: Search Engines love fresh, relevant content. The more content, the better. Links: You can compare it to a popularity contest. The more links you have coming into your site (inbound links) the more weight the search engines give that site. Especially if the links use keyword rich text (Anchor Text) and are related to what you do. There are plenty of free SEO Tools that will allow you to analyze these factors in a fast and effective way. SEO can be broken up into two categories. On-site optimizationare SEO techniques that are performed on your website.. Techniques include search friendly site structure, content, anchor text, internal link structure, title/meta/h/alt tags, url page names and keyword density. It’s important to have a good balance between off-site and on-site optimization. Trusted: Searchers trust the natural search results because they know that you can not buy your way to the top of google organically. Higher CTR: Your click through rates will be much higher because of that trust. Buyers: Generally people who are ready to buy, will choose from the natural listings, rather than the sponsored listings. Free Traffic: Once you have earned your way to the top of the search engine results you will reap the benefits by getting free traffic to your site. Time: SEO can be a very lengthy process, depending on your goals and competition. On-Going: To achieve high rankings you need to keep working at it. Constantly building links, adding new content, and tweaking tags will help you stay at the top. Also, search engines algorithms are always changing and improving. What worked today may not tomorrow. Its important to stay up-to-date with the new internet marketing trends and adapt to these new techniques. To have a well balanced internet marketing plan, you should strongly consider implementing both of these techniques. SEM and SEO compliment each other to bring in lots of quality traffic to your site. As a personal rule of thumb, I usually will start with Search Engine Marketing, to test keywords/phrases and see what people are actually searching for. Once I have identified the keywords that are performing the best, I will optimize for those keywords.